The Schlage Connect Touchscreen Deadbolt handleset and Accent lever with Camelot trim in Aged Bronze combines advanced features and compatibility with your home automation system, allowing you to control your home from anywhere and freeing you from the hassles of keys. The Accent lever is widely popular for its elegant wave-like design that effortlessly matches a room's style without overshadowing it, while the Camelot handleset's scalloped architectural details add instant charm. Our Aged Bronze finish is inspired by traditional design, featuring warm, copper tones that break through its darker, aged exterior. Plus, it's been designed and tested with strength and durability in mind. Tbook.com crawls the web to find the best prices and availability on Locks and related Tools and Hardware products like Schlage Camelot Aged Bronze Connect Smart Lock with Alarm and Right Handed Accent Lever Handleset. For this page, related items include products we find that match the following keywords: "Lock" at our vendor partner Home Depot. 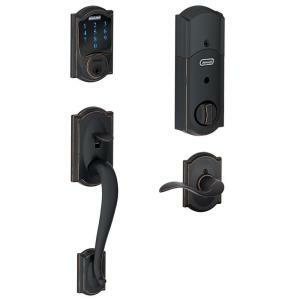 Schlage Camelot Aged Bronze Connect Smart Lock with Alarm and Right Handed Accent Lever Handleset is one of 147 Locks and related products listed in the Tools and Hardware section of Tbook.com If you have any questions on this product, please give us a call at 734-971-1210 during the hours of 9am - 5pm EST for assistance. Thank you for shopping at Tbook.com, the Internet Department Store!